Unfold the pastry sheet on a lightly floured surface. Cut the pastry sheet into 20 (1/2-inch) strips. Wrap the pastry strips around the frankfurters and press to seal. Place the pastries onto a baking sheet. Brush the pastries with the egg mixture. Bake for 15 minutes or until the pastries are golden brown. Remove the pastries from the baking sheet and let cool on a wire rack for 10 minutes. Serve the pastries with the mustard for dipping. For a Holiday Twist, use 5 frankfurters and cut each into quarters lengthwise, then cut in half crosswise, making 40 pieces in all. Twist each pastry strip into a spiral shape. 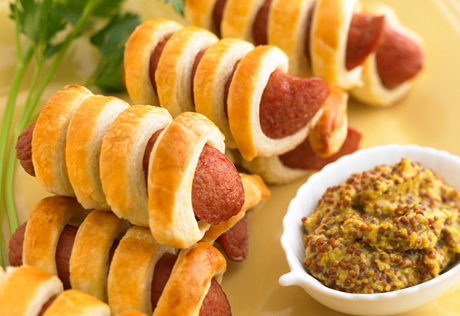 Wrap each twisted pastry strip around 2 pieces frankfurter and press to seal. Brush with the egg mixture and bake as directed above.